We are familiar and pleased with the calm and peaceful humming in the elevators – even when there is no voice to the sound. Why not take that comfort and create not just a restroom, but an entertainment abode that is void of worries? Apart from the cold droplets of water rushing down the shower, nerve calming country or rock music should rain down in a commercial restroom. Here is a research playlist from a wide range of genres. Some of which are not popular. They were fun to discover and hopefully, you and your customers will find them fun too. It is never easy to say the inspiration behind the song, this classic song is a perfect song for any restroom settings and more importantly, there is a “bathroom” in the title. This is probably the best song for any restroom. This deep-south country song speaks the thought that run through our minds and head. The whole song revolves around the bathroom sink. The bathroom sink is where a girl worries and puts on the smile as she forgets the whole worry behind her. Judging from the video of this song, it is the best musical tribute to the restroom we found in our search. There were even bathroom partitions in the video. This selection falls more on the rock side, this song by Modest Mouse is a reminder of the importance of washing your hands after using the restroom. For commercial space, an appealing and inviting bathroom is important in pleasing your customers and visitors. For entertainment and fun, it is a good idea to spice your restroom and bathroom design up with some song lyrics and make your customers glad they stopped by. Having music integrated into your commercial restroom can go beyond a place for comfort but a place that creates a charming ambiance. Restaurants, bars, and clubs that are trying to create certain image pipe the music from their dance floors into their bathroom because they don’t want their customers to miss a moment of the fun. But it is recommended that the sound should be kept low for bathroom users. For public and commercial restrooms such as stadiums, stores, malls and offices, some quiet music will help create a relaxed and peaceful atmosphere. You can include some of the songs listed above or some that you will suit the types of customers you have. Avoid harsh, controversial and offensive lyrics songs. Your commercial bathroom music must appeal to visitors. 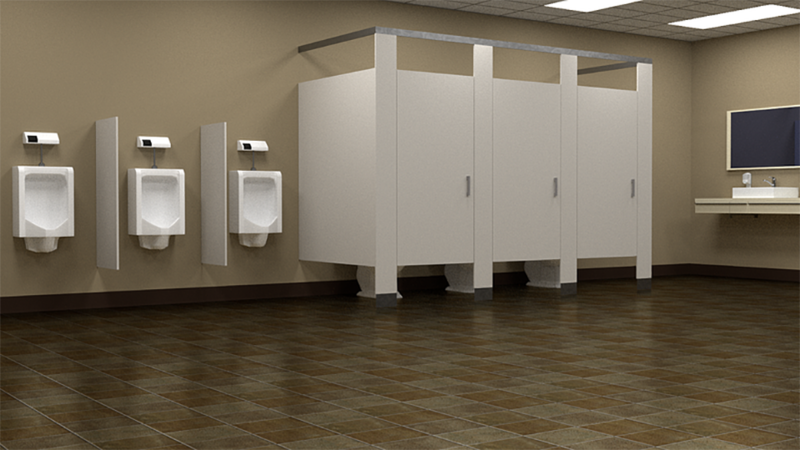 Allowing users of your commercial restrooms to feel safe and relaxed is important. The combination of clean, efficient bathroom partitions, attractive designs, and cool music play their part in creating an appealing bathroom design.